So once again this year, I’m thinking it’s dinner and dessert for two at the Cafe Little Prairie Kitchen. Since chocolate is high on our list of favorite ingredients in a decadent dessert, this year I’m whipping up a batch of ganache to cover a cake or some strawberries. Don’t let the fancy name fool you into thinking this is a super hard dessert, it’s not. 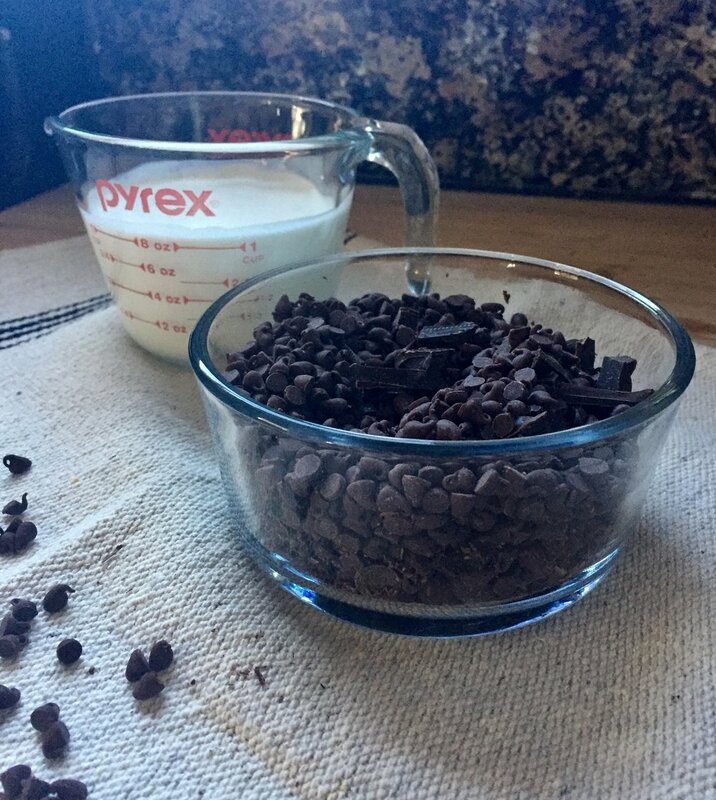 Ganache is just a fancy way of saying rich chocolate sauce and with only 2 major ingredients (chocolate and heavy cream), if you can boil cream and pour liquid, you can make ganache. Refrigerate any unused ganache. Ganache may be stored in the refrigerator for up to 5 days. Feel free to play with the ratios of dark chocolate to semisweet chocolate. If you are not a huge dark fan, you may want to use a less dark (under 70%) or simply omit all together and use 8 ounces of semisweet. Just be sure you use 8 ounces of chocolate in total. My favorite way to use up ganache is as a decadent frosting for a good chocolate cake. The ganache does not have the same whipped and fluffy texture that traditional frosting does, but the smooth spread and amazing flavor will make you forget all about frosting. Allow cake to cool completely before frosting. Another great use for this fancy chocolate sauce is warm and drizzled over your favorite ice cream. Homemade hot fudge at it’s best! I also love to dip strawberries in the warm ganache for a very fancy take on chocolate covered strawberries. Ganache should be refrigerated but can be reheated in the microwave. Heat for 20-30 seconds at a time, stirring ganache in between, until smooth and warm.